Apple cider vinegar: How much apple cider vineger do you need to drink to lose weight? Losing weight is never easy hence the plethora of diets available on the market today. There are many restrictive health plans available but people are usually urged by official NHS advice to eat less and move more, all while eating a balanced diet. Some people choose to use boosts, such as incorporating apple cider vinegar (ACV), into their diet instead of opting for a drastic change of food plan. Taking small amounts of ACV can help to lower cholesterol, as a BBC and Aston University study found for the Trust Me I’m a Doctor programme. Other studies have shown this particular type of vinegar may also increase the genes responsible for fat burning as it contains acetic acid. Health Line states ACV can help with weight loss and can rebalance the body with good bacteria for the gut. The vinegar makes people more full than usual stopping them from eating excess calories leading to weight loss. Other benefits are an improvement in metabolism, fat burning and a reduction in fat storage. Healthline said: “In one study, one or two tablespoons (15 or 30 ml) of apple cider vinegar daily for three months helped overweight adults lose an average of 2.6 and 3.7 pounds (1.2 and 1.7 kg), respectively. It is essential to get the amount of ACV used right as too much can prove dangerous to your teeth, throat and stomach because of the acidity. 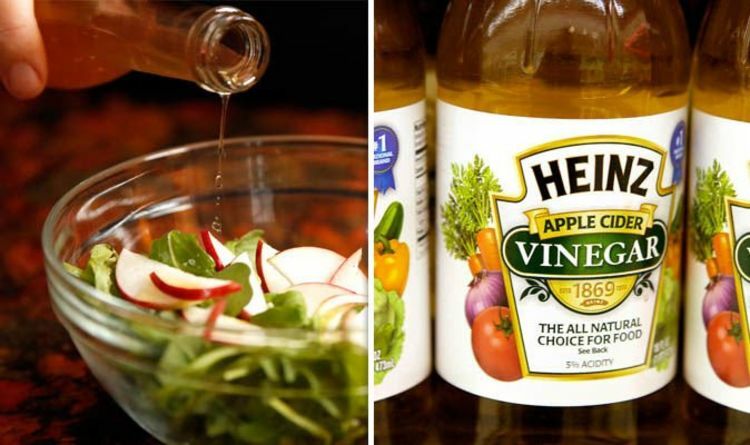 As the taste is not to everyone’s palate, if you do not want to add it to water, you can consume the vinegar as part of an oil-based salad dressing. You also do not need to have the two tablespoons at the same time, so trying spacing them out from one another. Two tablespoons of ACV have been shown to reduce fasting blood sugar the next morning when taken at night and can lower blood sugar levels after meals. If you plan on drinking apple cider vinegar diluted in your drinks, then it is recommended you consume it through a straw.